2draw.net - boards - Advanced - Froggers. Collab with Davincipoppalag. :D Grr... Already 1meg. We'll have to ask nicely for more space. I didn't start this drawing on the Collab board because I wanted 600px width. Feel free to move it to the collab board mods. Feel free to edit the background. Thought I'd just put a basic base down. Looks good to me fin ..Im a space user..so..I hope I can do this in one sitting....which means probably not till the weekend..
Lovely little frog.. looking forward to seeing poppasweetie's addition. Oh. I want to grab the frog and well..... keep Him/her. little..you wouldn't want to even touch one of these...highly toxic..
Ooooh, it turned out great. Beautiful frogs. What's wrong with the back foot? 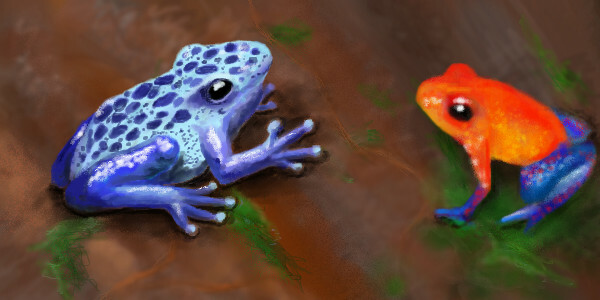 EDIT: "The poison arrow frog can hold enough venom to kill approximatly 100 grown adults"
Actually..they are both pretty tiny critters.. the blue one (i forget its real name) is somewhat a larger variety ..and the other one is really really little... both are smaller than a C sized battery! Wow!!! Their cute!! I have some around my property like that blue one but some are green and some brownish.. their really small also!!! Good Job you two, it pretty life like!!! You have poison tree frogs?? Where do you live??? Thank you Mazi.. Ok fin..we be done.. This actually looks even better now! Great job!!! very nice poppa and poppa's friend! gorgeous! Just stunning. This is my favourite artistic peice by you. Keep up the awsome work! Ha.. thanks.. not a good idea to touch poison tree frogs though! This is great. Love these colours and job done. I love this! The colors are so bright and amazing. I especially like the orange and blue one!